College loyalty isn't the first thing that stands out for Billy, but family loyalty is. Having arrived to Virginia and just about as he started making his mark in the ACC he decided to leave all the behind and follow his father to Rhode Island. He spent 1 year there and after a not-so-great run for Rhode Island, Jimmy Butler had to look for a different school to coach. Canisius took the opportunity and recruited Jimmy Butler and Billy followed his dad to a smaller college and a smaller conference(MAAC). But that was just the beginning for Billy, who became the driving force behind Canisius and managed to find himself in the spotlight leading his team with a 3-0 streak in his first season. He followed through with a solid season and that allowed Canisius to make its presence known. Next season he pulled out all the stops and averaged staggering numbers (24.1 points, 5.3 assists and 4.9 rebounds) with a very high efficiency rate ranking him as top in the country. Now in Europe he found a contract in a popular and respected team, Lietuvos Rytas. Albeit in a backup role he has left his mark in the game with his shooting ability. Pick and roll specialist. He'll be a great fit for any team running any types of pick and roll plays whether it's to create for the big men, to create for the big men shooters or to create for himself and punish the defense. If there is a pick there he'll find it. He is leader material. He wants to take the clutch shots and he is very competitive. Solid defender with good intangibles. Rebounds very well for his size. NBA shooting range. On many occasions he'll take a high percentage shot from downtown as soon as the defender gives him some space. He can shoot it from literally any distance. Very good shooting form with high release point and at the peak of the jump which increases his chances to get a good look and allows for a powerful release. Good pull-up shooter, good spot-up shooter, good free throw shooter, good shooter in every way. Strong body that can handle contact and he knows how to protect the ball going to the rim. He's not afraid to draw contact. Accomplished passer with good court vision. Technocratic approach to the game. He watches videos of the likes of Steph Curry and other NBA stars to enrich his moves repertoire. He is fairly athletic for European standards but lacks elevation. He relies mostly on his strength to get to the rim. Average height and wingspan but good enough for European standards. Let's face it.. the MAAC isn't the toughest conference out there and in Europe he's played a backup role in Lietuvos Rytas so he lacks solid experience of tougher opponents and play-off-style games. He can work on that though. Could use the left hand to finish around the rim a bit more. He doesn't have an explosive first step but he can accelerate with the ball and combined with his strength can take his defender all the way to the rim. Billy is at a point in his career where he could have a breakout performance and make a name for himself. It only takes a club to take a chance on him and put him at the helm of the team and the starting PG position with solid minutes. He wasn't phased by playing less minutes like many other players do after their transition from the NCAA. His ability to play the pick and roll can land him a contract in a variety of European countries and his stint with Lietuvos Rytas only adds credence to that. Not athletic/explosive enough to make an NBA contract but he can have a solid career in Europe like his brother Jimmy and can establish himself as a team-carry and a leader. He's got longevity in his game with his shooting skill. 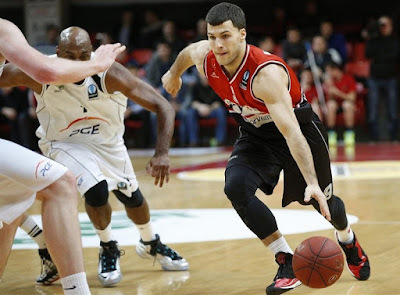 Below are some of his highlights from last season with Lietuvos Rytas.